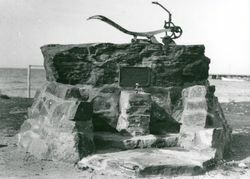 Monument is a small replica of a Bratten Plough, commemorating the Brattenising system of road-making originated by Robert Bratten, Overseer of Works for the District Council of Tumby Bay. Robert Bratten came to Australia from Ireland at the age of 20 years. He was appointed to the position of Overseer, in 1906 when the council received many petitions for new roads to be opened. After initial surveys the first roads had to be made through scrub areas which were manually cleared, just tracks. Originally roads were macadamised by breaking big stones with a hammer until they were small enough to pass through a 2.5 inch ring. This sufficed until motor cars required stronger surface for speed and weight. Big sheet limestone was a problem so a special plough was designed to plough the stones to the surface, the larger ones disposed of, and the smaller ones curshed and used. First the road was formed by the grader and then rolled with a heavy roller. Geoff Ferguson patented the beams and slides that held the plough upright E.E. Excell and and Sons with A.W. Carr made a patented complete plough with beam and wheels, which made the plough more suitable for heavy work and transporting, with the capability of being towed by a tractor instead of horse drawn. This method was called Brattenising, this method of road making enabled a wide road to be made, especially in limestone country. Wide use of this system was introduced in various parts of the state, such as the Murray Mallee and Yorke Peninsula. he monument reads — Erected by members and officers of the District Councils of Eyre Peninsula and the Murray Lands as a mark of appreciation of the valued services rendered to the community by Mr. Robert Bratten, Overseer of Works in the District Council of Tumby Bay in inaugurating the brattenising system of road making. The inventor was presented with Mr. Fergusson's letter also several autographed and bound volumes, dealing with road work in the various States. Bunyip (Gawler, SA), 12 October 1934. Erected by members and officers of District Councils on Eyre Peninsula and the Murray Lands as a mark of appreciation of the valued services rendered to the community by Robert Bratten Overseer of Works District of Tumby Bay in originating the Brattenising system of road making.